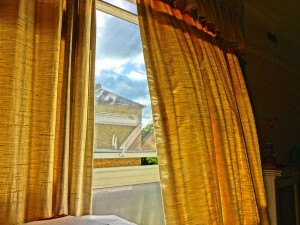 “Tocht” is the suction of the wind in a room when you for example open windows on opposite sides. 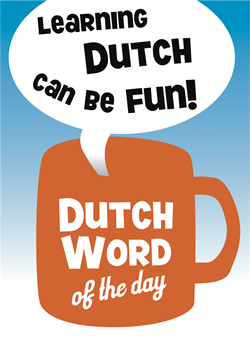 The verb is ‘tochten’. A common expression is ‘op de tocht komen te staan’, see below. – “Op de tocht zitten”: to sit in a draught. – “Op de tocht (komen te) staan”: to be put at risk, to be in the balance. – Tochten: to be draughty/drafty, to let the wind through (a room) [verb] [tochtte, getocht]. – Tochtig: draughty/drafty [adjective]. You can also talk about a ‘tochtige koe’: a cow in heat. – Tochtgat: blowhole, draughty/drafty spot [noun] [het tochtgat, de tochtgaten]. – Wind: wind [noun] [de wind]. 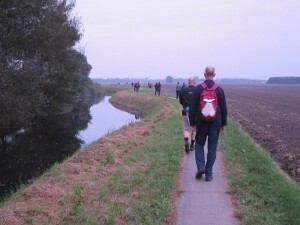 “Tocht” can also be used for ‘journey’ or ‘trip’. Duration of the ‘tocht’ should be clear from context, a ‘tochtje’ is a short trip like an outing. A ‘dagtocht(je)’ is an outing for the day. – “Een (dag)tochtje maken”: to go on an (day) outing. You can also use this expression (without the ‘dag’) to say that you are going for a ride, but it would be a longer ride than just around the block. – Uitje: outing [noun] [het uitje, de uitjes]. Here you can also say ‘een uitje maken’: to go on an outing. – Reizen: to travel [verb] [reisde, gereisd]. – Reisje: short trip [noun] [het reisje, de reisjes]. This entry was posted in Dutch word of the day, DWOTD 1.0, Vocabulary Basic and tagged dagtocht, dagtochtje, tocht, tochten by Sander. Bookmark the permalink.